To study how the ocean behaves in the glacial fjords of Antarctica and Greenland, we normally have to go there on big icebreaker campaigns. Or we rely on modelling results, especially so to determine what happens when the wind or ocean properties change. 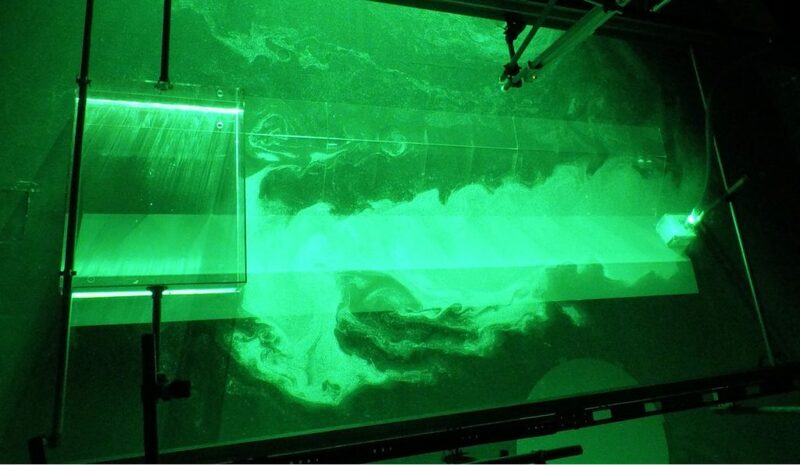 But there is also a third option that we tend to forget about: we can recreate the ocean in a lab. This is exactly what our Bergen-Gothenburg team has been doing these last weeks at the Coriolis facility, in sunny Grenoble. Take a 13m diameter (circular) swimming pool. Install it on a rotating platform, and start turning to simulate the Coriolis force, i.e. the impact of the Earth rotation on the flow. Fill it so that the water level reaches 90cm. Actually, the exact value does not matter and can be changed; just make sure that your tank width is an order of magnitude larger than your depth, and that you do not overflow everywhere on the lab floor. Congratulations, you have an ocean! But for now it is a bit boring. Let’s add some stratification and density-driven currents. As we explained in a previous entry, all you need to do for that is change the temperature and/or salinity of your water. The people here at the Coriolis facility say that changing the salinity is easier than the temperature, so ok, put a source somewhere in your tank that will spit out salty water. Make it even more realistic: have some trough, underwater mountains, solid ice shelves etc. Or rather, some Plexiglas of the corresponding shape. Now you have a beautiful part of the ocean with realistic currents! But how do you observe it? You can lower probes into the water at specific locations, as if you were doing miniature CTD casts in your miniature ocean. Or you can visualise the whole full-depth flow: add tracer particles to the water flowing from the source (in our case, biodegradable plastic), shoot lasers at it at various depth levels, and take high resolution pictures as you do so. Then, you can track the particles from one image to the next to infer their velocity, using a method called PIV. What does it look like when you fire lasers at a large rotating tank? 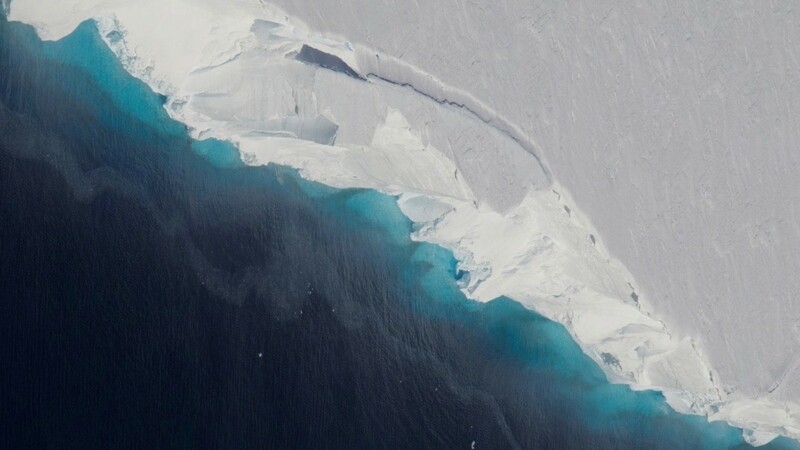 The water flows from the source on the right of the image, towards the ‘ice shelf’ on the left. We are watching the scene from above, from our office that rotates with the tank. The laser successively illuminates several levels from the bottom of the channel to the water surface, revealing the changing structure of the flow with depth. In our real experiment, it took more than 10 minutes for the water to reach the ‘ice shelf’ – here, I have slightly accelerated it. It is surprisingly peaceful and relaxing to watch. Well, there is tension and suspense regarding what the flow will do since this is, after all, why we are here. But otherwise you are in the dark, with particles shining all around you, in the silence except for the low-squeeking noise of the rotating tank, gently rocked by the vibrations of the platform, and there is not much you can do but wait and enjoy the view. You can also count how many undesired bubbles and dead insects floating at the surface you can see! Why do we need rotating tank experiments? under which conditions do these waters penetrate under the ice? at which depths do they sit? 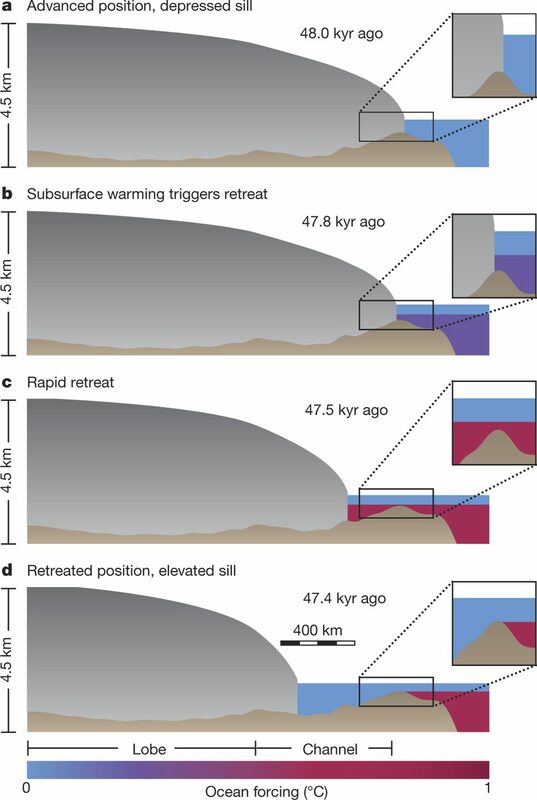 what are the impacts of stratification and the shape of the ice shelf itself? These questions cannot easily be answered by going in the field. We would need access to many ice shelves, year round, and the ability to observe the flow everywhere –including under the ice– synoptically. Instead in the lab, we just need to adjust our flow speed, or the rotation speed of the tank, or the amount of salt in the source, and we are ready to observe! “Positive feedback” is a term that regularly pops up when talking about climate change. It does not mean good news, but rather that climate change causes a phenomenon which it turns exacerbates climate change. The image of this week shows a beautiful melt pond in the Arctic sea ice, which is an example of such positive feedback. What is a melt pond? eventually, the water from the ponds ends up in the ocean: either by percolation through the whole sea-ice column or because the bottom of the pond reaches the ocean. Sometimes, it can also simply refreeze, as the air temperatures drop again (Polashenski et al., 2012). 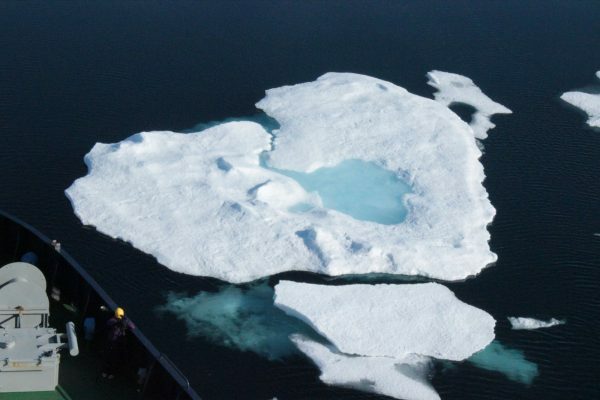 Melt ponds cover 50-60% of the Arctic sea ice each summer (Eicken et al., 2004), and up to 90% of the first year ice (Perovich al., 2011). How do we know these percentages? Mostly, thanks to satellites. Like most phenomena that we discuss on this blog, continuous in-situ measurements are not feasible at the scale of the whole Arctic, so scientists rely on satellites instead. For melt ponds, spectro-radiometer data are used (Rösel et al., 2012). These measure the surface reflectance of the Earth – i.e. the proportion of energy reflected by the surface – for wavelengths in the visible and infrared (0.4 to 14.4 μm). The idea is that different types of surfaces reflect the sunlight differently, and we can use these data to then map the types of surfaces over a region. In particular for the Arctic, sea ice, open ocean and any stage in-between all reflect the sunlight differently (i.e. have different albedos). The way that the albedo changes with the wavelength is also different for each surface, which is why radiometer measurements are taken for a range of wavelengths. With these measurements, not only can we locate the melt ponds in the Arctic, but even assess how mature the pond is (i.e. how long ago it formed) and how deep it extends. These values are key for climate change predictions. Let’s come back to the positive feedback mentioned in the introduction. Solar radiation and warm air temperature create melt ponds. The darker melt ponds have a higher albedo than the white sea ice, so they absorb more heat, and further warm our climate. This extra heat is also transferred to the ocean, so melt pond-covered sea ice melts three times more from below than bare ice (Flocco et al., 2012). This vicious circle heat – less sea ice – more heat absorbed – even less sea ice…, is called the ice-albedo feedback. It is one of the processes responsible for the polar amplification of global warming, i.e. the fact that poles warm way faster than the rest of the world (see also this post for more explanation). But it’s not all doom and gloom. For one thing, melt ponds are associated with algae bloom. The sun light can penetrate deeper through the ocean under a melt pond than under bare ice (see Fig. 2), which means that life can develop more easily. And now that we understand better how melt ponds form, and how much area they cover in the Arctic, efforts are being made to include more realistic sea-ice properties and pond parametrisation in climate models (e.g. 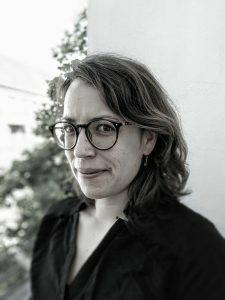 Holland et al., 2012). That way, we can study more precisely their impact on future climate, and the demise of the Arctic sea ice. 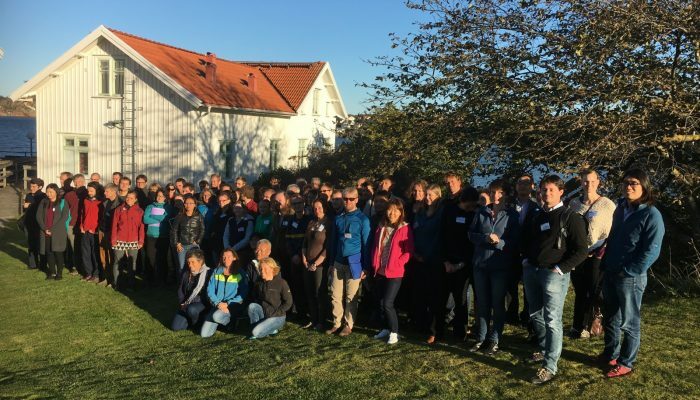 The Forum for Research into Ice Shelf Processes, aka FRISP, is an international meeting bringing together glaciologists and oceanographers. There are no parallel sessions; everyone attends everyone else’s talk and comment on their results, and the numerous breaks and long dinners encourage new and interdisciplinary collaborations. In fact, each year, a few presentations are the result of a previous year’s question! The location changes every year, moving around the institutions that are involved with Arctic and Antarctic research. 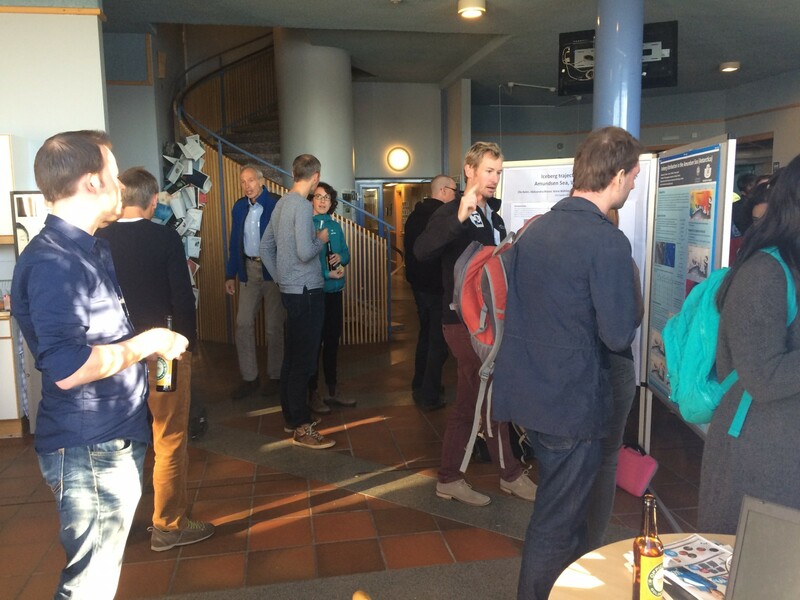 The 2016 edition just occurred this week, 3rd – 6th October, in a marine research station of the University of Gothenburg, in the beautiful Gullmarn Fjord. Each year, a few presentations are the result of a previous year’s question! Drank 50 L of coffee, 60 L of tea, 20 L of lingon juice… and a fair amount of wine! I can’t really choose THE highlight of the conference. As an organiser, it was a real pleasure to simply see it happen after all the long hours of planning. As a scientist, it was a great and productive meeting, giving me new ideas and the opportunity to discuss my recent work with the big names of the field in a friendly environment. And as a human, I enjoyed most the under-ice footages, and in particular the general ”ooooh” that came from the audience. It was a bit sad to say goodbye to the participants, old friends and new collaborators. But I know that I will see them again during FRISP 2017… and I hope to see you there as well! Polar surface water, circumpolar deep water, dense shelf water, North Atlantic deep water, Antarctic bottom water… These names pop in most discussions about the ice-ocean interaction and how this will change in a warming climate, but what do they refer to? In our second “For Dummies” article, we shall give you a brief introduction to the concept of “water mass”, explain how to differentiate water from more water, and why you would even need to do so. At the poles in contrast, there is a net deficit: more energy is leaving than is coming from the Sun (who is absent in winter). The global ocean and atmosphere circulations act to reduce this imbalance, by transporting the excess heat from the tropics to the pole. Here we will focus on the global ocean circulation only, since this post is written by an oceanographer, but similar principles also apply to atmospheric circulation. 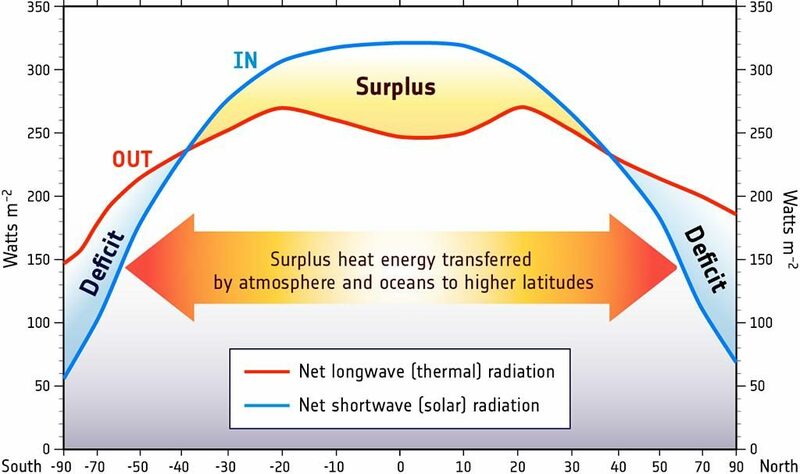 Fig 1 :Earth’s latitudinal radiation bugdet, The tropics show a surplus of energy that compensates the Poles’ deficit [Credit: National Oceanograpy Center]. We talk about “the global ocean circulation” because although the Earth officially has five oceans, they are not totally separate bodies of water. In fact, the Arctic, Atlantic, Indian, Pacific and Southern oceans are interconnected, with water circulating and moving between them. How does this happen? 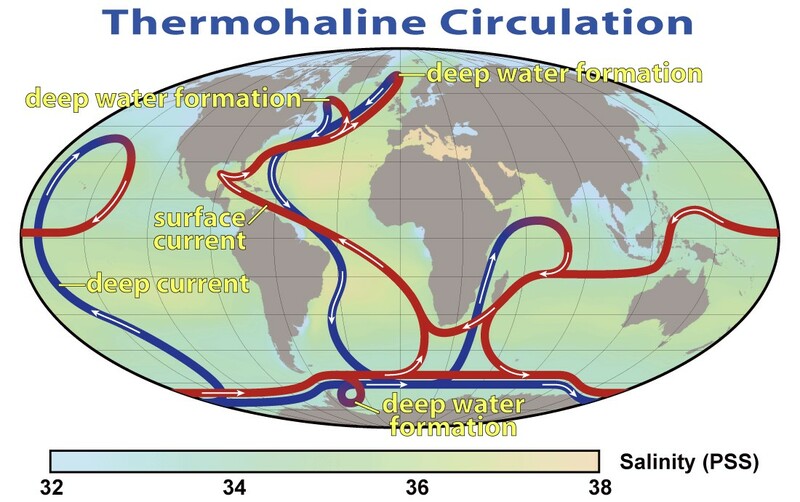 And the thermohaline circulation (shown on Fig. 2), slower but which affects the whole depth of the ocean. The temperature (‘thermo’) is mostly controlled by heat exchange with the atmosphere or the ice. Cold water has a high density. The salinity (‘haline’) can be modified by evaporation, precipitation, or addition of fresh water from melted glaciers/ice sheets or rivers. Salty water has a high density. Fig 2- The global thermohaline circulation shows warm surface currents in red, cold deep currents in blue. Deep waters form in the North Atlantic and Southern oceans [Credit: NASA]. Roughly speaking, a water mass is any drop of the ocean within a specific range of temperature and salinity, and hence specific density. Some water masses are found at particular locations or seasons, while others can be found all around the globe, all the time. Since density sets the depth (density MUST always increase with depth), water masses will lie and travel at particular depth levels. Some are the result of the mixing of other water masses. The others start at the water surface, where they exchange gas (notably oxygen and carbon) with the atmosphere. When a water mass becomes denser than the waters below it , for example, if it is cooled by the wind or ice, it sinks to its corresponding depth within the ocean. 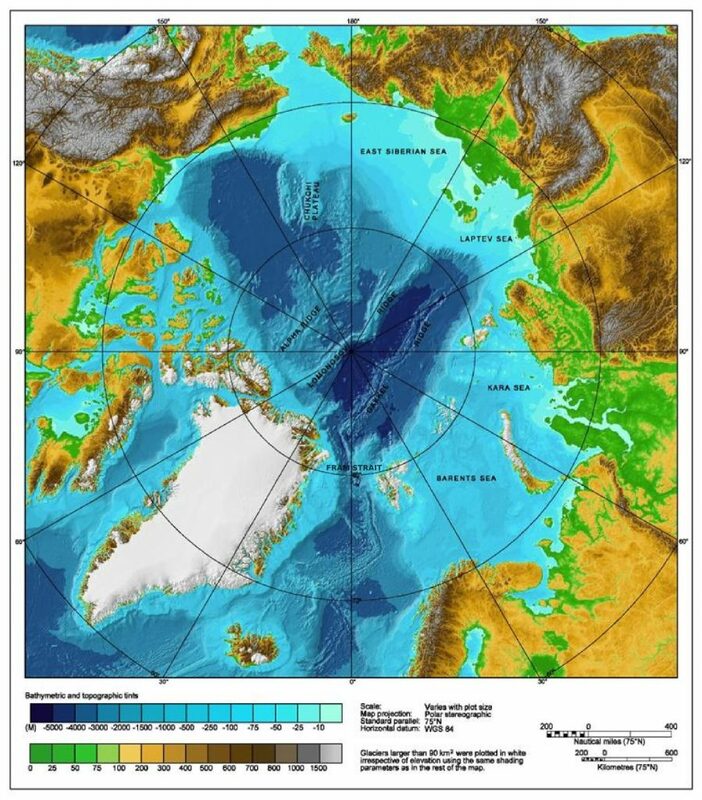 Fig 3- The bathymetry of the Arctic Ocean forces dense (deep) water masses to enter the region via Fram Strait whereas lighter (shallower) waters can go through the Barents Sea [Credit: adapted from IBCAO bathymetry map, Jakobsson et al., 2012 ]. 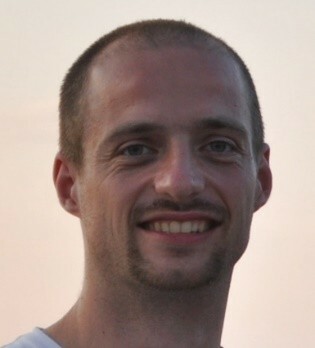 …provided their density allows it. The vertical distribution of density in the ocean must be “stably stratified”, which means that the density increases with depth. In practice, that means that dense waters cannot climb up a shallow bathymetric feature but have to find a way around it. For example to enter the Arctic Ocean (Fig 3), a dense water mass has no choice but to go via Fram Strait, whereas a less dense one can go via the Barents Trough. Similarly, there is a depth limit of about 500 m to reach the northwestern Greenland glaciers. Or rather, not all these properties change considerably with space and time. We are not talking only about temperature and salinity, but also about gas and chemical concentrations. It is then possible to track a water mass as it travels around the globe or watch its evolution with time. 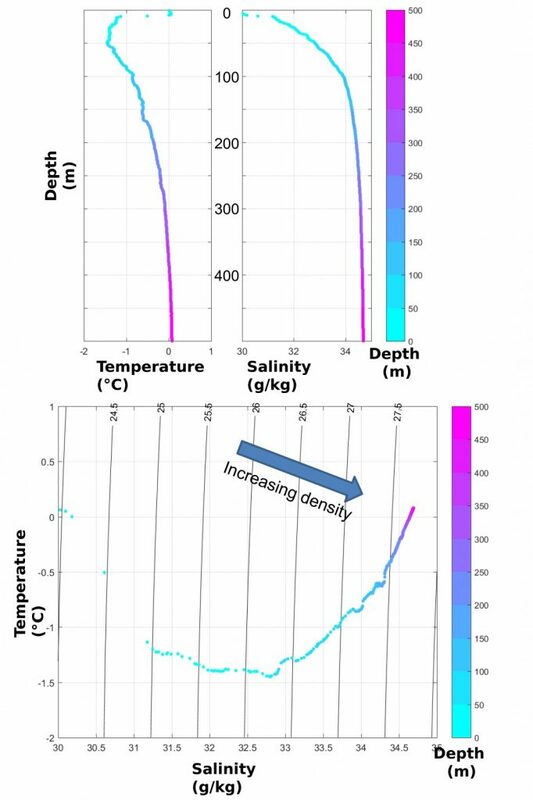 Visualising water properties can either be done with one graph showing how the temperature varies with depth plus another one for the salinity (multiplied by the number of locations to be observed at the same time); or all of this information can be combined on one image (as done on Fig. 4). This image is called a T-S diagram it and shows how the temperature (T) varies as a function of the salinity (S). It is customary to also draw the lines of constant density (the ‘isopycnals’, black on Fig. 3). These isopycnals give information about the types of mixing happening and the stratification, but we will talk about that in another post. Fig 4 – an example of how to combine several profiles (top) into a T-S diagram, for one of the randomly selected Arctic historical points that I work with [Credit: C. Heuzé]. Because each water mass occupies a very specific region of the T-S diagram (see Fig 5 for an example in the Atlantic), identifying them is relatively easy once you have plotted your data on such diagrams. 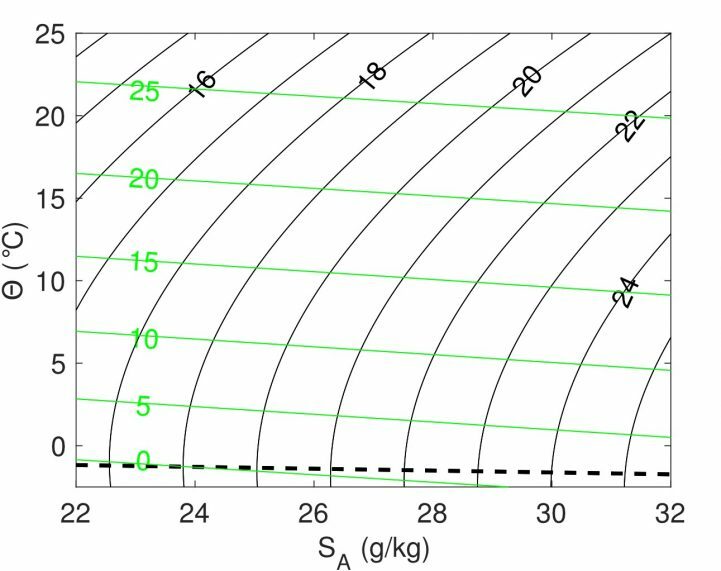 Why do ocean water masses matter to the cryosphere? 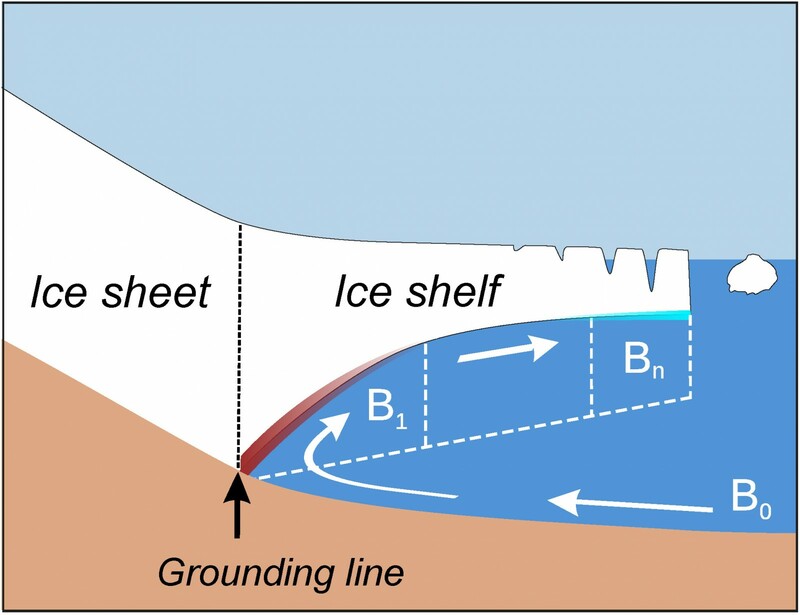 Marine ice sheet instability, and more generally basal melting, is caused by warm dense waters melting floating glaciers from below; how dense the water mass is determines whether it can even reach the glacier. Sea ice formation and melting can be largely affected by water masses moving up and down, especially is those going up are warm. Each aspect of these interactions is already experiencing climate change and is much more complex than this brief overview… but that will be the topic of another post! Rahmstorf, S., 2006: Thermohaline Ocean Circulation. In: Encyclopedia of Quaternary Sciences, Edited by S. A. Elias. Elsevier, Amsterdam. Munk, W. H. (1950). On the wind-driven ocean circulation. Journal of Meteorology, 7(2), 80-93. Killworth, P.D. (1983) Deep convection in the world ocean. 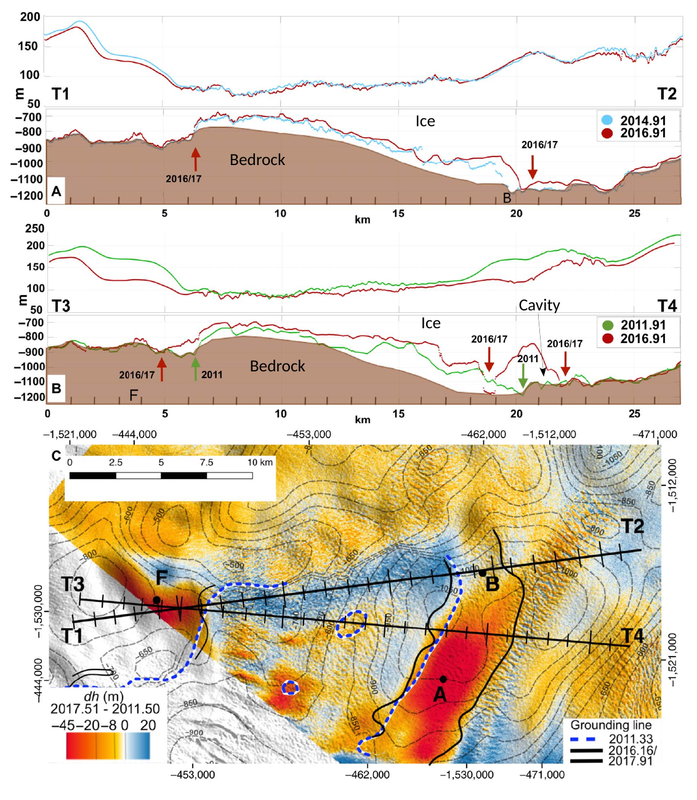 Reviews of Geophysics, 21(1), 1-26. Nicholls, K.W. 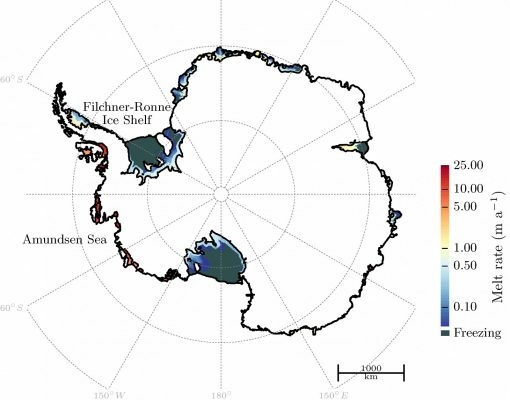 et al (2009) Ice-ocean processes over the continental shelf of the southern Weddell Sea, Antarctica: A review. Reviews of Geophysics, 47(3). Emery, W. J., & Meincke, J. (1986). Global water masses-summary and review. Oceanologica Acta, 9(4), 383-391. Representation of the (a) summer and (b) winter oceanic circulation within the Adélie region, East Antarctica. 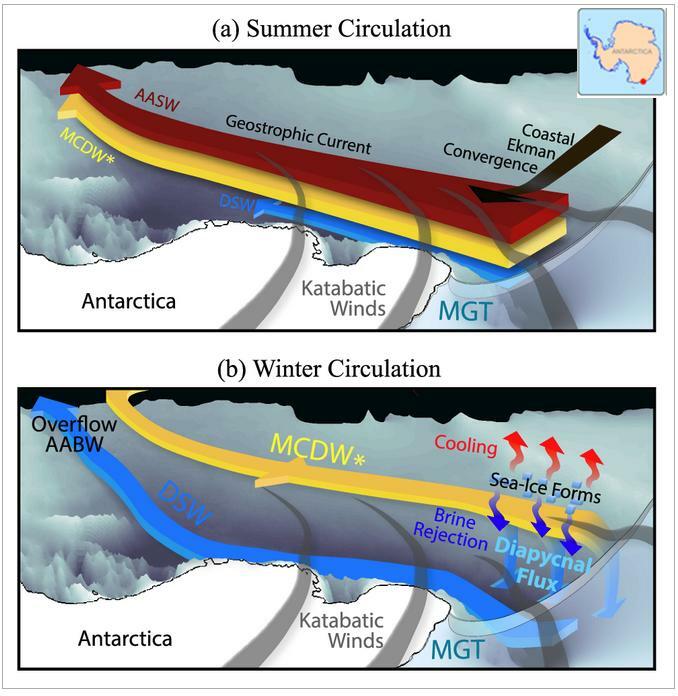 MGT = Mertz Glacier Tongue (red dot on the Antarctica map); other acronyms indicate different water masses: Antarctic Surface Waters (AASW), Modified Circumpolar Deep Water (MCDW*), Dense Shelf Water (DSW) and Antarctic Bottom Water (AABW) explained below. [Credit: reprinted with permission from Snow et al. (2016, figure 4) ]. Click here here to enlarge the image. 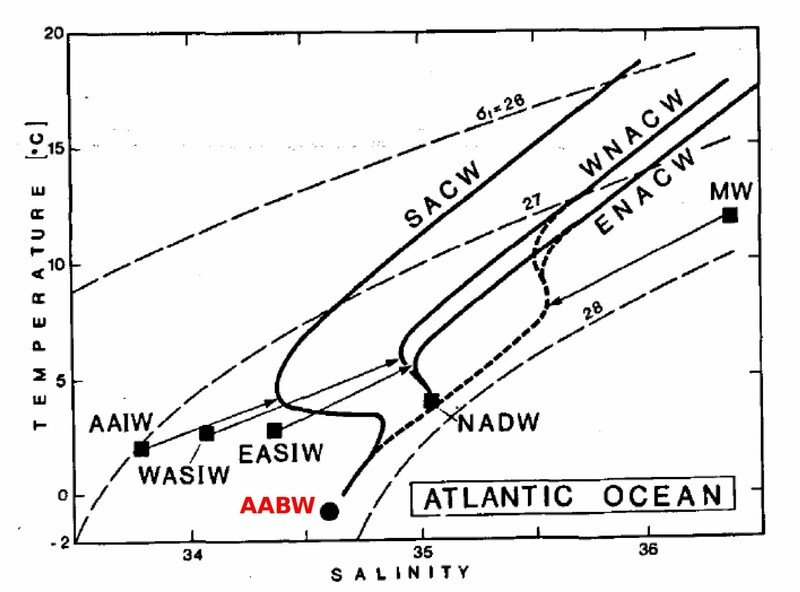 Very dense waters leave the shelf as Antarctic Bottom Water (AABW) that will then flow at the bottom of all oceans. Meanwhile, relatively warm water from the Southern Ocean, Modified Circumpolar Deep Water (MCDW*) comes on the continental shelf and brings heat to the ice shelves. That is, Antarctic cross-shelf circulation influences the water mass that transports heat, carbon and nutrient all around the globe in very large volumes (Purkey and Johnson 2013), and the basal melting of Antarctic floating ice (Hellmer et al. 2012), hence the stability of the whole Antarctic ice sheet. Although critical for both the ocean and the cryosphere, very little is known about the mechanisms behind cross-shelf circulation. We know that the mechanisms that control it vary on a seasonal time scale (Snow et al. 2016b). However, most hydrographic observations around Antarctica are taken in summer, when there is less sea ice and when the Southern Ocean is the least stormy. This means that we have very few measurements of the seasonal variations of the cross-shelf circulation itself. Why does it matter that the cross-shelf circulation varies between summer and winter? Three words: sea level rise. 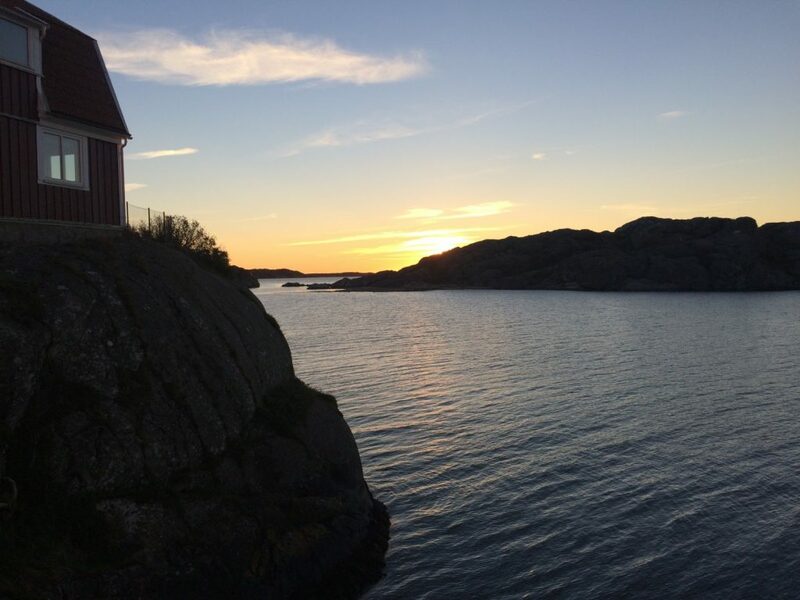 Nearly half of the world’s population lives in coastal areas (UN report). Antarctica contains enough ice to raise the sea level by 60 m, and although a total melting is very unlikely, current rates could raise the sea level by 1m by 2100 (read more about it on AntarcticGlaciers.org). To project future sea level rise and design relevant coastal defences, we need models to predict when and where the Antarctic ice will melt. A better observation strategy is needed if we want our models to correctly represent Antarctic basal melting and the global ocean circulation. In summer, the circulation is mostly controlled by the strong katabatic winds blowing from the interior of the Antarctic continent towards the ocean. All the surface water masses go in the same direction, simply following the Antarctic coastal current. Nothing really happens at depth. In winter, the circulation is also controlled by buoyancy forcings, that is changes in temperature or salinity at the surface of the ocean. Here, these mostly occur in a polynya (a hole in the sea ice cover) where the “warm” ocean is cooled by the very cold atmosphere, and where the surface becomes very salty as sea ice reforms (a process called “brine rejection”: salt is expelled from the new ice as water freezes). 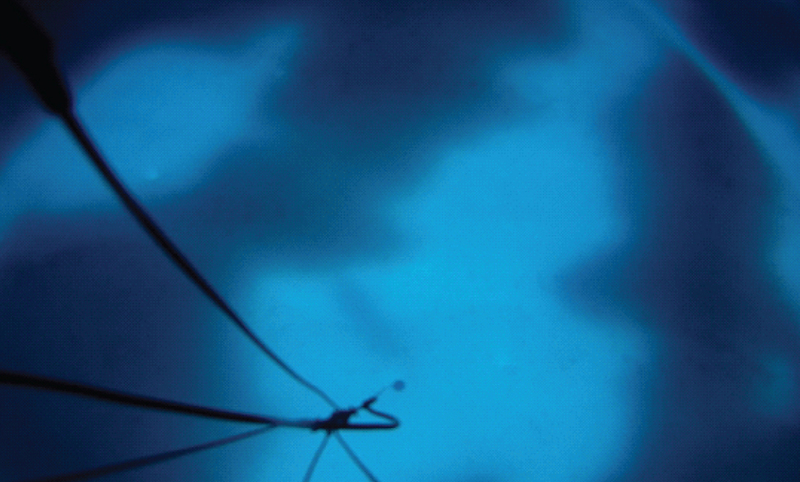 These buoyancy forcings form dense water (DSW), which sinks to the abyss and off the shelf as AABW. Mass conservation means that something else (here MCDW*) needs to come to the shelf to compensate for that outflow. You can notice that MCDW now flows in the opposite direction than it did in summer. Summer data is better than no data. But always be aware of the limitations of your model if you don’t have the datasets to test it– you may have a surprise when you do! Snow, K., B. M. Sloyan, S. R. Rintoul, A. McC. 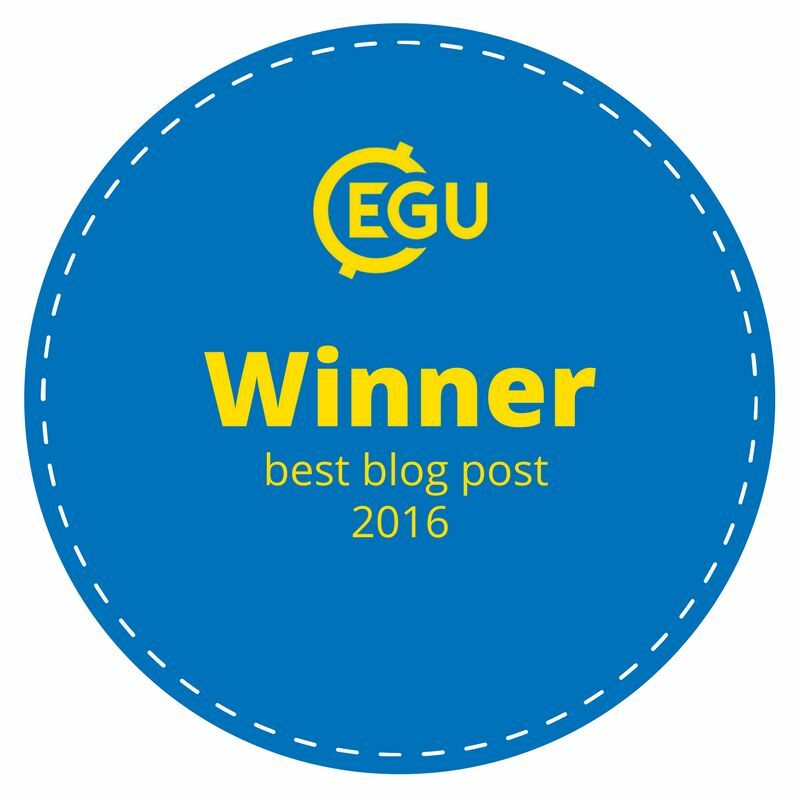 Hogg, and S. M. Downes (2016), Controls on circulation, cross-shelf exchange, and dense water formation in an Antarctic polynya, Geophys. Res. Lett., 43, doi:10.1002/2016GL069479.